A gorgeous drop of faceted Krystall coupled with a magnificent cast pendant in sterling silver, of a gorgonia or sea fan coral. Each cast coral is a one of a kind reproduction of sea fans in Sterling silver. The corals are collected from the beach where they have been washed out by waves. They become beautiful pieces of jewelry, shapes given to us by nature. A reminder that we should protect the earth and all of its species. Gorgonias are actually animals, although they resemble plants. The undersea groups of these odd and fascinating beings are known as “animal forests”. Corals hold the key to healthy seas, thus a healthy earth and even further the preservation of our own species. 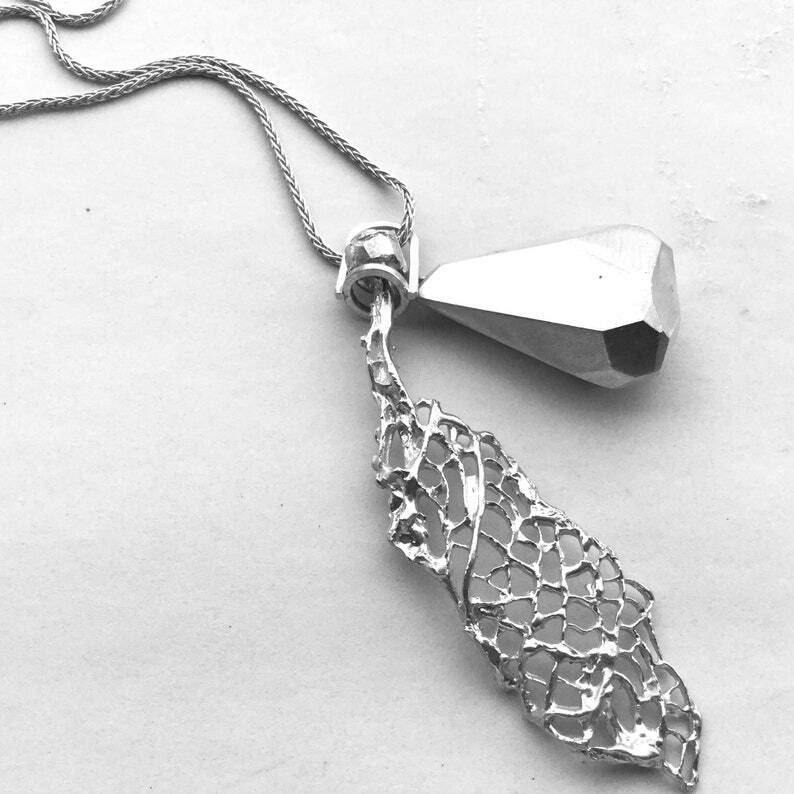 This pendant is made of cast sterling silver worked in clean irregular facets with a satin matte finish, and hung on a long and sturdy 26in. sterling silver wheat chain (1mm thick) with a lobster clasp. A special piece to keep and protect and let it last and live through generations. The Krystall pendant is about an inch and half tall and a half inch deep. A piece well worthy of being given on a very special occasion, such as wedding, engagement, graduation or equal. This piece comes beautifully gift packaged and can be directly shipped to the lucky recipient. Please specify shipping address on the "note to seller" field when ordering.